The latest news in health and sport, delivered straight to your inbox. 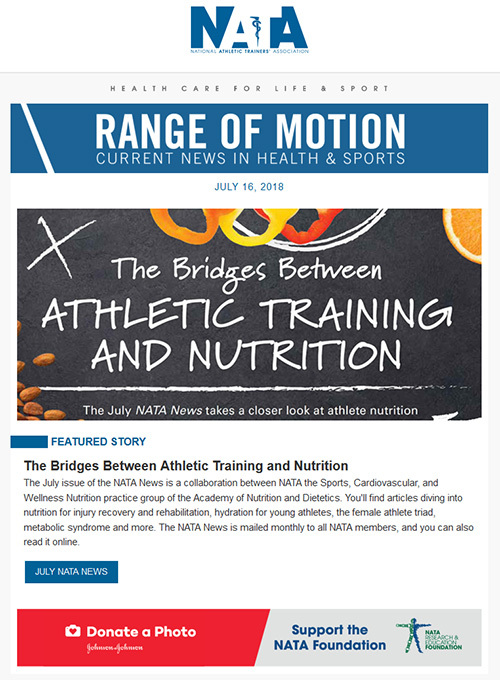 Range of Motion is a weekly email for NATA members covering the latest updates from sports medicine. The newsletter includes links to our latest resources, information about upcoming events and curated news articles to help you stay current on what’s happening in the athletic training field. The newly redesigned Range of Motion features a responsive design that translates to all devices so you can catch up on the news while on the go. Athletic training is a dynamic profession that is rapidly evolving and progressing, and Range of Motion is designed to deliver the latest updates straight to your inbox to make your life easier. If you’re an NATA member but aren’t receiving Range of Motion in your inbox each Monday, please contact us so we can help. Note: As of July 16, 2018, we are now sending this email from "communications@nata.org," so please add that address to your safe sender list to ensure this newsletter doesn't get filtered to your spam inbox.